Mondays are always a bit cheerier when they're dressed in pink. Honestly, I could wear some variation of this shade every day of the week. Not only is it a beautiful, feminine color but it also looks gorgeous on just about everyone. Whether it's a soft muted shade, a pretty blush or bright azalea, there's a perfect pink for everybody. Just ask Bobbi Brown, she built an empire on it, haha. If you couldn't agree more then this luxury tote might be just the thing. Yes, it's a splurge but when you consider how often you'll reach for it and how well it will pull so many of your looks together the cost per wear becomes much more reasonable! But, if that's still a little more than you want to dish out then this chic little number is a great choice. I love the clean lines and gold detailing and that it's under $200. Spring is already on my mind and with that I grabbed a pair of these sneakers. They are so cute and super comfortable. I'm loving the idea of them with yoga pants, cozy hoodies and step hem denim. Get'em if you love them because they'll sell out fast. 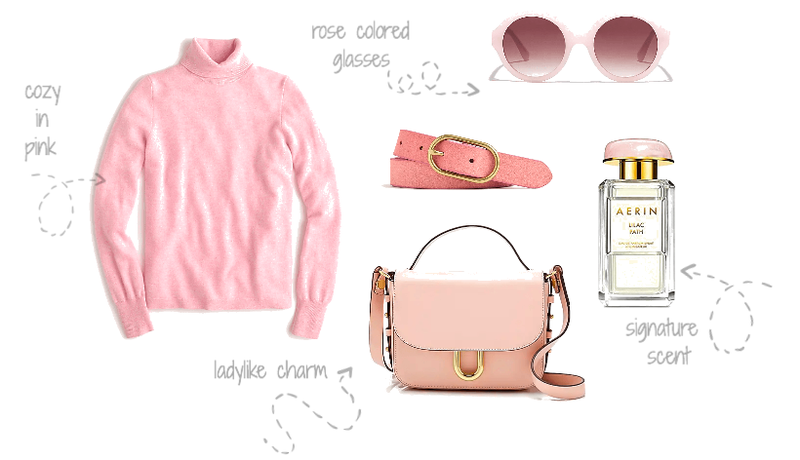 I've linked all the other sweet pink pieces for you all below. Hope everyone has a productive Monday!